*This post contain affiliate links. When I was a child each fall I would help my grandfather carve a pumpkin and help my grandmother roast the seeds. The ritual was one of my favorite October activities. 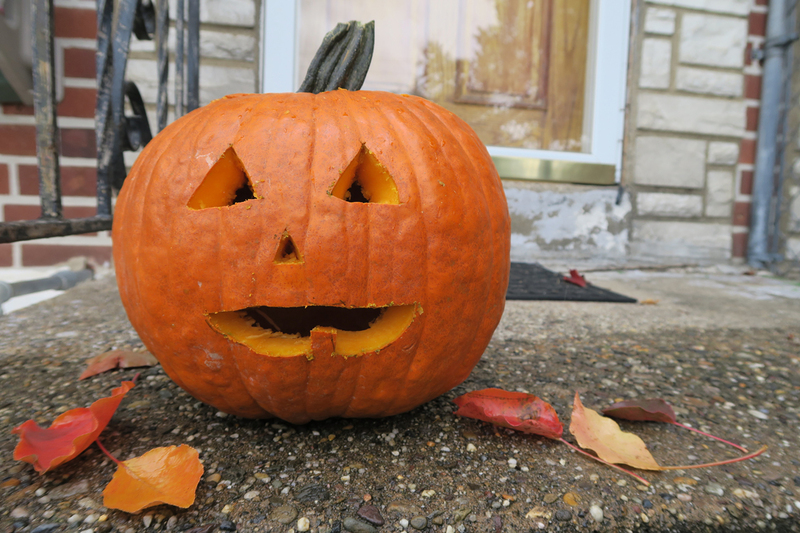 I haven't carved a pumpkin or roasted seeds since I left home for college many years ago. I decided this year was the year to pick the tradition back up in my own home. 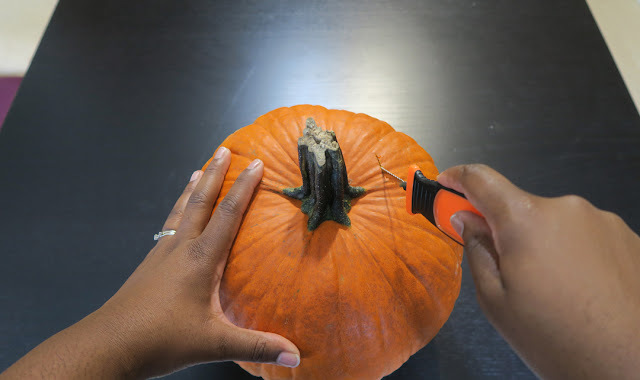 Wipe down your pumpkin with a damp cloth to get rid of all the dust and dirt. 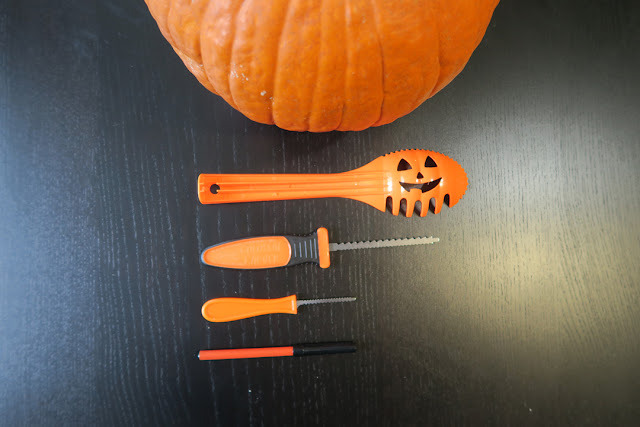 Grab a pumpkin carving kit. There are plenty of different options available on Amazon HERE. 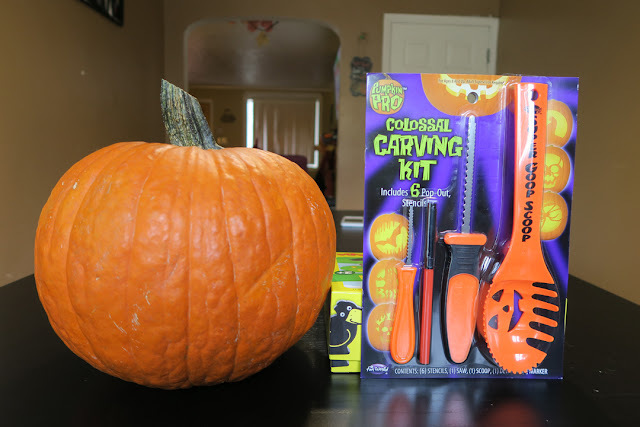 Using the largest cutting tool cut a hole in the top of the pumpkin big enough for you to put your arm through. 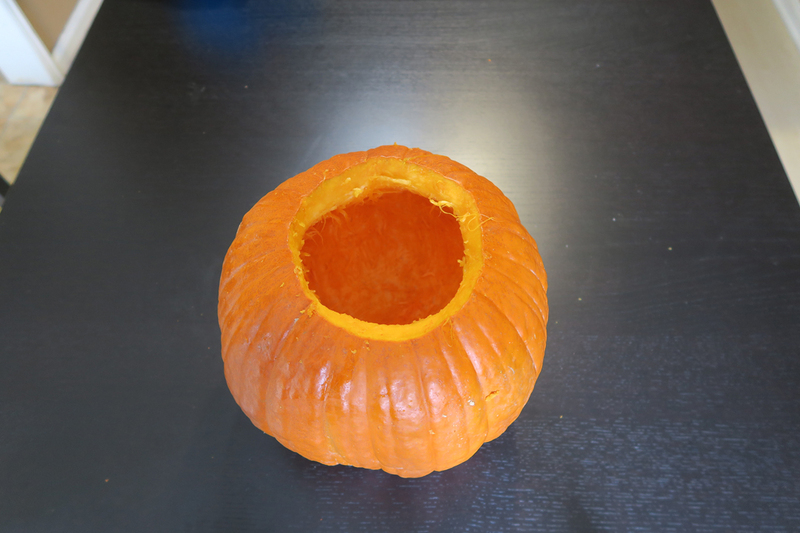 Lift your newly created pumpkin lid. 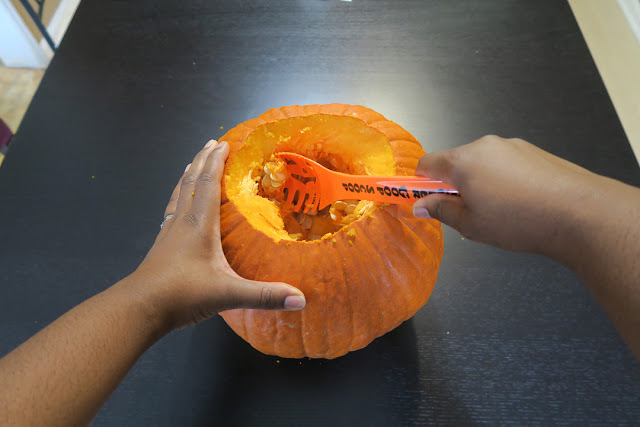 If it doesn't lift easily use a spatula for leverage to loosen the pumpkin membrane holding onto the lid. 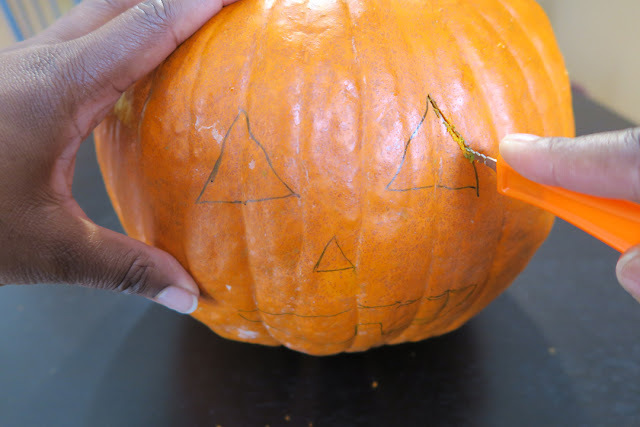 Clean up the underside of your lid so that it is smooth and rid of the stringy pumpkin pieces. 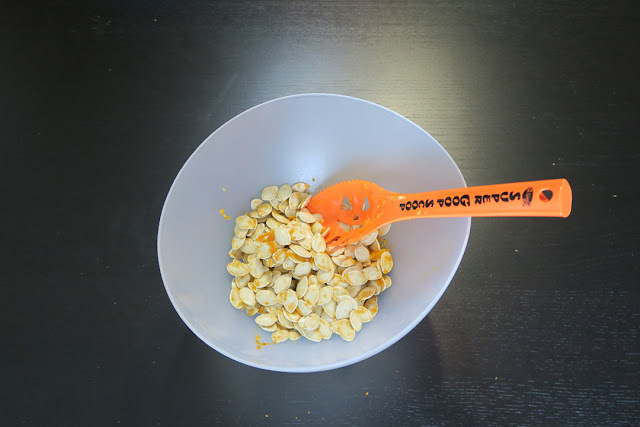 Scoop out all the pumpkin insides with the spoon like tool but save the seeds! Recipe for those below. I like to have two bowls while I'm cleaning out the pumpkin, one for the seeds and one for the rest of the pumpkin insides. To create your design you can either use a stencil or draw freehand. Although my pumpkin carving kit came with a number of stencils I did a freehand of a classic jack-o-lantern with a snaggletooth. Using the smaller cutting tool cut out your design. 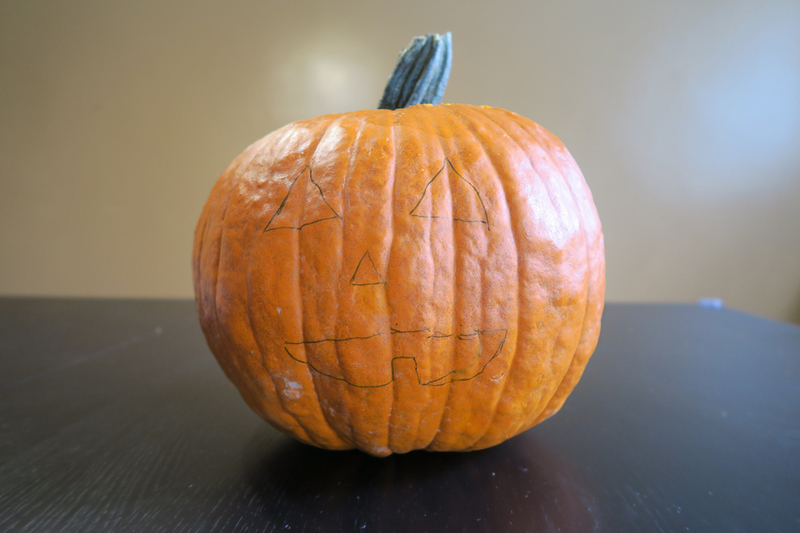 Place your pumpkin lid and your carved pumpkin is complete! For lighting opt for an LED light to avoid a fire hazard. 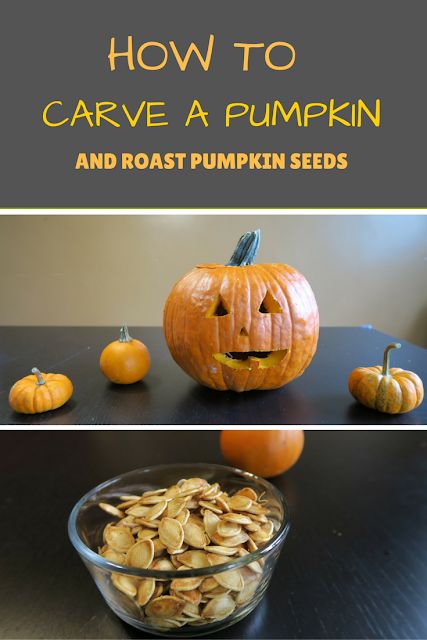 Now that the pumpkin is carved lets go back to those seeds! 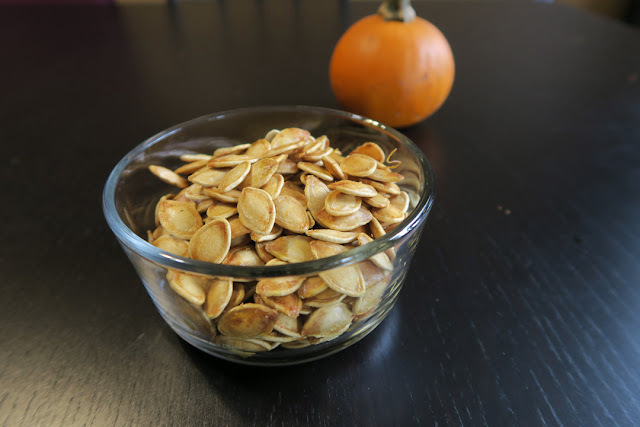 Rinse the pumpkin off your seeds. Do this by filling your bowl with water and swishing the seeds around for a few seconds. The seeds float to the top and the pumpkin membrane falls to the bottom so you can scoop the seeds off the surface of the water. Pat seeds dry. 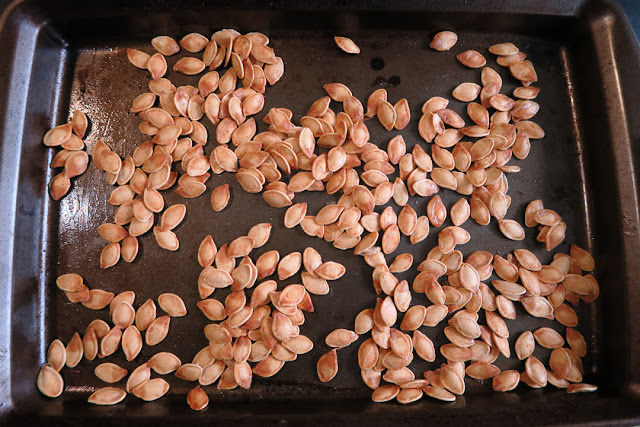 Toss seeds in 1 1/2 tablespoons of melted butter and a few sprinkles of salt. Lay them in a single layer on a baking sheet lightly coated with cooking spray. I like to use coconut oil spray. Bake for 33 minutes or until golden brown. Stir the seeds every 10 minutes or so. What fall tradition or recipe do you look forward to each year? I haven't carved a pumpkin in ages. I miss it! 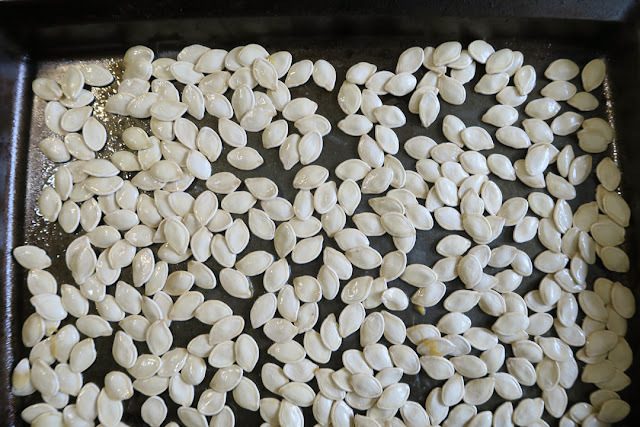 We love roasted pumpkin seeds around here. They're the best!